Latest News: KEAM CEE on 31/03/2019, has postponed the KEAM 2019 exam to 2nd May 2019 and 3rd May 2019!!! About: Kerala Engineering Architecture Medical Examination(KEAM) 2019 is an entrance exam for candidates seeking admission to the professional Degree Courses. Candidates can get admission in Engineering, Medical, Agriculture, forestry, Veterinary, Fisheries, Pharmacy and other courses in the various colleges of Kerala. Authority: The KEAM exam 2019 is conducted by the CEE of Kerala (Commissioner of Entrance Examinations), which has been approved by Government of Kerala. The Allotment of seats through this exam is done via a single window system and a centralized allotment process (CAP). Nationality: Only the citizens of India can apply for KEAM 2019. PIO/OCI i.e. Persons of Indian Origin/Overseas Citizen of India Card Holders will also be considered as Citizens of India. PIO/OCI aspirants are not eligible for any type of reservation. Courses Offered: Through KEAM 2019 candidates can get admission in the field of B.Tech (Agriculture, Food, Dairy Tech. ), Medical courses (MBBS, BDS, BAMS, BSMS, BHMS, BUMS), B.Pharma, BFSc., BVSc & AH, BSc. Hons. (Agriculture, Forestry). Allotment process: KEAM Allotment 2019 will be done through a single window system and centralized allotment processes (CAP). Admissions: Allotment and admissions of the Colleges/ Courses under Engineering/ Architecture/ B.Pharm/ Medical/ Agriculture/ Veterinary/ Fisheries will be subject to the receipt of the Central and State regulatory Universities and Government. Commissioner of Entrance Examinations (CEE) of Kerala has extended the KEAM 2019 application last date till 4th March 2019, from previous last date of 1st February 2019. You have time till 5 PM on Monday, 4th March 2019 to fill the form now. Admissions: Candidate seeking admission for Medical, Agriculture, Forestry, Veterinary and Fisheries courses will get admission based on the merit of 'Nationality Eligibility Entrance Test' NEET Result score in KEAM 2019. Courses: For admission of Architecture courses, the merit will be assessed by giving the equal weightage to the marks obtained in the 'National Aptitude Test in Architecture' (NATA 2019), conducted by 'Council of Architecture' (COA), and the grade/ marks in the qualifying examination will be a criterion. Registration: The KEAM 2019 Application Form for admission into Engineering, Architecture, B.Pharm, Medical, Agriculture, Veterinary, and Fisheries, in various colleges in Kerala, will be available on the official website from 1st February 2019. The last date to fill the application form is 28th February 2019. Note: The CCE has extended the last date from 28th February 2019 to 4th March 2019. Admit Card: Those who have applied for the KEAM 2019 can download the KEAM 2019 admit card from 10th April 2019 from the KEAM CEE 2019 official website. Exam Paper: KEAM 2019 exam consist of two papers. Paper-I includes Physics & Chemistry and Paper-II includes Mathematics. B.Pharma Candidate: Those who are appearing for B.Pharma need to write only one paper i.e. Paper I that includes Physics & Chemistry. Counselling: Candidates who have qualified and ranked in the KEAM 2019 result list, are eligible for the KEAM counselling. The date of 2019 counselling will start from the 20th June 2019 and will go on in multiple rounds, till all the seats are filled. Get more information about KEAM 2019 Important Dates. Engineering courses / B.Tech: Candidates should have passed Higher Secondary Examination / 10+2 or its equivalent from Central or any State board, with 50 % marks in Physics, Chemistry and Mathematics/Biology are eligible for the B.Tech. Architecture Course: Candidates should have passed Higher Secondary Examination / 10+2 or equivalent from Central or any State board, with Mathematics as a compulsory subject, with a minimum of 50% marks. OR the candidates should have completed Diploma (10+3) in any stream from any Central/State Government universities with a minimum of 50% marks and with Mathematics as one of the subjects of the examination. OR the candidates should have completed diploma from International Baccalaureate, after 10 years of schooling, with more than 50% marks aggregate and with Mathematics as compulsory subject of examination. B.Pharm Course: Candidates should clear 10+2 exam or its equivalent board, with 50% marks in Biology/Mathematics separately and 50% marks in Physics, Chemistry and Biology/Mathematics all combine are eligible. Categorized based on Authority: Candidates are considered under various Categories according to Keralite, Non-Keralite(NK-I), Non-Keralite (NK-II) based on their nativity/domicile. And, you can check the category you come under and whether you are eligible for KEAM 2019. Relaxation in marks: KEAM 2019 offers relaxation in marks for the reserved category applicants. If the candidate belongs to this category they are eligible to take the benefit. P.H. Category Candidates: The candidate who comes under P.H. category i.e. Physically Handicapped category, there is a relaxation of 5% marks. P.H. Candidates should have passed 10+2 or equivalent a minimum of 45% aggregate in Physics, Chemistry, and Mathematics, from Central or any State board, are considered as eligible candidates to take KEAM 2019 exam. Reservation Category: For the candidate who comes under reserved categories such as scheduled castes (SC), scheduled tribes (ST) and other backward classes (OBC), there is a relaxation of 5% marks in aggregate. The candidate who comes under this category should have passed 10+2 or equivalent a minimum of 45% aggregate in Physics, Chemistry, and Mathematics, from Central or any State board, are considered as eligible candidates to take KEAM 2019 exam. Application Form Availability: KEAM 2019 Application Form will be available from 1st February 2019 onwards. Application Form Last Date: KEAM 2019 Application Form will be available until 4th March 2019. Make sure you fill the application well before the last date to avoid any inconveniences. Course Selection: Candidate needs to choose the desired courses while filling the KEAM 2019 Application Form online. Upload Documents: While filling KEAM 2019 Application form, candidates need to upload the scanned documents such as Signature, Photograph, Left Thumb Impression. Candidates should make sure that scanned documents should be in ".jpg" or ".jpeg" format. Payment Structure: General category candidates have to pay the KEAM 2019 application fee of INR 800, and the candidates under the SC/ST category are required to pay a fee of INR 400. The ST candidates whose family income is less than INR 40,000 and below are exempted from paying the application fee for the exam but will have to submit the income and caste certificate as a proof of the same, during the counselling process. Engineering Exam Pattern: KEAM 2019 will have two set of papers. Candidates who are appearing for engineering entrance examination will have to attend both paper-I - (Physics and Chemistry) and paper-II (Mathematics and Biology). B.Pharm Exam Pattern: Candidate applying only for B.Pharm will have to give only one paper i.e. paper-I - Physics and Chemistry. Exam Dates: KEAM 2019 exam paper-I will be conducted on 2nd May 2019 whereas paper-II will be conducted on 3rd May 2019. Mode of Examination: The KEAM 2019 examination will be conducted in offline mode i.e. Pen and Paper based-test (PBT). The students have to mark one of the correct among the four choices on the OMR sheet. Duration and No. of Question: For each paper, candidates will get 150 minutes (two and a half hours) to answer 120 questions. KEAM 2019 Time Table: The exam on both days will start at 10 AM and will end at 12.30 PM. Get more information about KEAM 2019 Exam Pattern. Admit Card Availability: KEAM 2019 Admit Card will be available only on the official website of the CEE. Candidate can download admit card from 10th April 2019 onwards. Information Contains: Information regarding the KEAM 2019 Admit Card is candidate’s name, application number, examination centre, timings and more will be available on the KEAM 2019 admit card. Discrepancy: If a candidate found any mistakes or discrepancies in the downloaded Admit Card, then he/she should report the issue to the CEE as soon as possible and get it rectified to avoid any possible disqualification on the exam day. ID Proof: Candidate needs to carry any one of the government-issued photo ID proof along with the Admit Card. Photo ID proof may be any one of the PAN Card, Adhar Card, Voter ID Card etc. Subjects: KEAM 2019 syllabus consists of different topics under the subjects of Physics, Mathematics, and Chemistry. Majority of the syllabus will be similar to the qualifying examination of 12th standard. Level: The candidates will get the questions from the syllabus of class 11th & 12th in KEAM 2019 exam. Previous Year Paper: Candidate can also check the KEAM Previous year question papers to understand the level of difficulty and type of questions. Topics: Candidate needs to cover all the topics which come under 11th and 12th Physics, Chemistry, and Mathematics. Result Date: KEAM 2019 result will be declared from 22nd May 2019. The candidate is advised to visit the official website of the CEE to view their result. Cutoff Marks: You need to score a minimum of the Cutoff Marks to be ranked / qualified to seek admissions through KEAM 2019. The cut-off is arrived at by keeping a ratio of available seats and your relative performance in the KEAM 2019. Also, cut off varies from programme to programme and college to college. Marks Weightage: Result of KEAM 2019 exam carries equal weightage of Paper-I & Paper-II and marks obtained in 10+2 or its equivalent level. 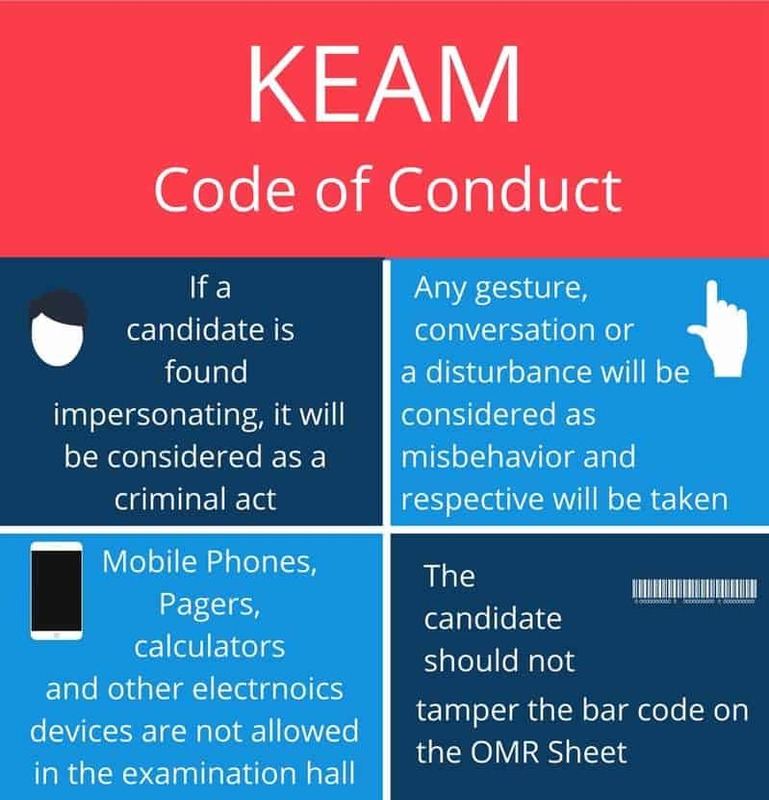 Note: Each candidate needs to download the KEAM 2019 Score Card. There is no provision to send the scorecard to the candidates' residential addresses. Counselling Date: Counselling session will be announced on the official website after the KEAM 2019 results are declared. The candidates are required to look out for the counselling schedule and attend the same with the necessary documents. The process of counselling starts from 20th June 2019. Seat Allotment: The seat allotment will be done via the Centralised Allotment Process (CAP) through Single Window System (SWS). The seat will be allocated on the basis of rank acquired by the candidate and options filled in. Tuition Fees: The candidate needs to pay the admission fees i.e. tuition fees at the time of counselling if they are allotted seat from KEAM 2019 exam. Document Verification: Candidate needs to carry a document for verification such as KEAM 2019 Admit Card, KEAM 2019 Result, Academic Certificate, Migration Certificate, Physical fitness, Birth Certificate etc. Get more information about KEAM 2019 Counselling. The KEAM 2019 Physics and Chemistry exam has been conducted on 2nd May 2019 and Mathematics exam will be conducted on 3rd May 2019. The official KEAM 2019 answer key will be released on 30th April 2019 by the conducting authority, CEE. Candidates can make use of the answer key to analyze their possible marks in KEAM 2019 examination. You can challenge the CEE if found any errors in the answer key. You should send your complaint to the CEE in writing along with the required documents. To challenge the answer key, along with the documents you are required to pay INR 100 per question via demand draft in the favour of CEE and payable at Thiruvananthapuram by post or hand delivery so as to reach the office before 30th April 2019. If the challenge is found correct then the fee will be remitted to you. Syllabus: KEAM 2019 syllabus is based on 11th and 12th or equivalent. To check the exam pattern and syllabus, see the previous year question papers. Mock Test: Start solving the previous year question papers so that speed and accuracy will increase. Keep on practising the sample paper for a better result. Time Management: KEAM 2019 exam is offline mode i.e. candidate need to fill OMR sheet. It is advisable to practice filling OMR sheet before the exam so that unnecessary wastage of time will be avoided. Accuracy: KEAM 2019 is an objective type of examination. While the time of filling option candidate needs to pay attention to avoid mistakes and wrong entries. You are advised to bring a writing pad/board along with the Admit card for the Examination. You should use of ballpoint pen (either blue or black ink) for writing KEAM 2019 examination. It is required to fill up the entries on question booklet and OMR Answer Sheet. Use of pencil is strictly prohibited. You will not be permitted to take items such as pencil, eraser, correction fluid, whitener, calculator, logarithm table, electronic gadgets, mobile phones etc, into the examination hall. You are advised to be present at least 30 minutes before the scheduled time to the examination hall. No candidate will be permitted to enter the examination hall 30 minutes after the commencement of the examination. You have to show your Admit card to the invigilator and the Board appointed officials as and when requested. Candidate without an Admit card or with Admit card having defigured soiled or distorted photographs will not be allowed to sit for the examination. You will be permitted to leave the examination hall only after completion of the examination. Scratch papers are provided to all the candidates for rough work at the examination hall. Rough work cannot be done on any other paper/sheet, as nothing will be allowed inside the exam hall. You are not allowed to use the prohibited things such as Calculators, Slide Rules, Log Tables, Geometry Box, Pencil box, Electronic Digital Watches with facilities of calculators, mobile phones, pagers or any other electronic gadget. In case of impersonation, the candidature of the concerned candidate will be cancelled outright and the impersonator will be handed over to police for the criminal act. The candidate should not manipulate & fabricate submitted documents like Admit card, Allotment letter, Datasheet etc. The candidate should not tamper Barcode in the OMR sheet or Write unnecessary information on OMR sheet. Application form availability: The KEAM 2019 application process will begin on 1st February 2019. Last date for application form: Registration for KEAM 2019 closes on 28th February 2019. Admit card: The Admit Card for KEAM 2019 will be available on 10th April 2019. Exam date: KEAM exam will be held on 2nd May 2019. Citizenship: Candidates must be an Indian or Person of Indian Origin or an Overseas Citizen of India. Qualification: Candidates must pass 10+2 from Central or State Board to take KEAM 2019 exam. Minimum aggregate: Minimum of 50% aggregate marks candidates must score qualifying for an exam. Subjects: In order to be eligible for Technology and Agriculture courses candidates must clear Physics, Chemistry, and Mathematics exams. Visit Official Website: Candidates who are eligible to apply for KEAM 2019 can visit the official website to register themselves and apply for the exam. Availability of Application Form: The application form release date will be on 1st February 2019. Fill the Necessary Details: Once the form is available, candidates who satisfy the eligibility criteria for KEAM 2019 has to fill in details regarding their identity, qualifications and contact details. Photograph, signature and thumb impression: For KEAM 2019 candidates should make sure that a recent passport-sized photograph,digital signature along with their thumb impression is uploaded in the form. Application Fee: KEAM 2019 application fee is INR 1000/- for General Candidates and INR 500/- for Reserved Quota Candidates. Payment Method: Candidates who filled the form online must pay the fees online through net banking, debit card, credit card or Demand Draft. Document Submission: Draft details must be filled in while registering online and the draft must be sent physically to the exam conducting authority. Acknowledgment: Candidates will get the admit card when the candidates receive acknowledge from KEAM 2019. Mandatory: The KEAM 2019 admit card must be carried to KEAM 2019 exam center without fail. Registration: Only those candidates who have registered for the exam will get the admit card. Availability: Admit card will be available online and it will not be sent by post to any candidate. Enter details: By entering the application number, captcha, and date of birth candidates can download their KEAM 2019 admit card. Subjects: KEAM 2019 examination consists of Physics, Chemistry and Mathematics. Questions: Each paper will have 120 questions. Every correct answer will fetch the candidate 4 marks and there will be negative marking of 1 mark for each incorrect answer. Exam Mode: KEAM 2019 exam will be held in pen and paper mode i.e. offline mode. Papers: KEAM 2019 examination consists of Physics, Chemistry as paper-1 and Mathematics as paper-2. Duration: KEAM 2019 exam duration is of 2 hours and 30 minutes i.e. 150 minutes. Paper 1: KEAM 2019 paper 1 combines syllabus from Physics and Chemistry. Paper 2: KEAM 2019 paper 2 contain Mathematics syllabus. Physics syllabus: Kinematics, Electrostatics, Gravitation etc. Chemistry syllabus: Hydrogen, Solutions, Equilibrium etc. Result Availability: To check results of KCET 2019 exam candidates need to visit the official website and it will not be available on any other portal. Result Declaration Date: KEAM 2019 results will be announced on 22nd May 2019. Login Details: Students are requested to use their registered details and index number to access the results. Aggregate score: The KEAM results will be an aggregate score of paper 1 and paper 2. Official portal: All the counselling details will be available on the official portal. For the counselling, process candidates need to visit the KEAM 2019 official website. Necessary Documents: The selected candidates must carry their original marks cards and certificates to the counselling center. Candidates must also carry admit card, results for KEAM 2019, academic certificates, passport photo and character certificates to the counseling venue. Report: Students must report to the college to confirm the admission. The eligibility criteria to get admission in our college is to qualify KEAM and also through NRI quota, there are students who took admission. Since, I haven't wrote keam, I took admission as NRI. 1) The eligibility criteria are that we should get at least an average of 50 % for maths physics and chemistry. And we should also get 50 %for maths alone in 12. 2) The entrance (KEAM) is the main examination of the breach engineering in Marine. We should get at least 10 marks in both papers of KEAM. (10 marks May vary). The eligibility criteria for a bachelor of technology in civil engineering was 10+2 pass with science subject. Admission as merit was based on entrance examination result. KEAM (Kerala Engineering Architecture Medical Entrance Examination) was the entrance exam which I took. I got into Colege of Engineering Trivandrum in the year 2015. The admission procedure for the college follows the entrance examination common to all the state government engineering colleges in the state, the Kerala Engineering and Medical Entrance Examination KEAM. You have to be in the top ranks to be admitted to the college. My rank in the KEAM 2015 exam was 1462. I only got into the college in the third round of allotment. However, the departments like Computer Science, Electrical and Electronics, Mechanical and Electronics and Communication Engineering have a lower threshold for admitting students. To get an admission in Malabar College of engineering and Technology either you have to get a decent rank in KEAM entrance exam that is conducted at all Kerala level then you have to only pay the government fees or you can pay the management fee and join there. I personally appeared for KEAM but i was not able to get a good rank so i just paid the management fee. The general academic requirements state that the candidate who have passed Higher Secondary Examination, Kerala, or Examinations recognized as equivalent thereto, with 45% marks in Mathematics, Physics, and Chemistry. The selection of the candidates is made on the basis of the marks secured in KEAM. Candidates should qualify (a minimum of 10 marks each in Paper I and Paper II) in the Engineering Entrance Exam conducted by the Commissioner of Entrance Exams, Govt. of Kerala(KEAM) and should be listed in KEAM Rank List. Highly recommended college for everyone, the college is having the best faculty members and facilities needed by any student. The eligibility criteria start by passing KEAM entrance test. The eligibility criteria are very easy as for admission is based on KEAM entrance exams and also there are management quotas where you will get admission if you score a 60% in your school level. I got the admission to NSS COLLEGE in 2017.I wrote KEAM Entrance exam for getting admission and got 40000 rank.The college gave the admission by reservation category.There the admission procedures are simple, just 3 step.First, filling the form that includes your personal details. The eligibility criteria are just KEAM and 12th. If you have more than 60% in class 12, and a KEAM rank not higher than INR 50k, you will do excellent here. When other colleges take only the best as it's inmates and vomit them out the way they are, this place takes in students from a wide range of academic, financial and family backgrounds, and help them graduate with the best set of skills one can basically hope for. The necessary entrance exam to appear for is KEAM. Having a better rank in KEAM will lead to a high amount of fee reduction. The maximum number of intakes for this course vary from 60-120, depending on the branch. I filled the application form, but I don't know about the exam centre. Where the exam will be held? You will get the exam centre name and details on the Admit card of the KEAM 2018. What are the courses that are offered through KEAM 2018? Can I BAMS after qualifying? The courses offered through the KEAM 2018 are as follows. Yes, you can take admission in BAMS. can you let me know the minimum age. The applicant must be 17 years old to be on the eligibility list of KEAM 2018 examination. Can you tell me the syllabus in brief? KEAM 2018 syllabus is based on 11th and 12th or its equivalent. To check the exam pattern and syllabus, see the previous year question papers. Reference Books: Candidates get many books available in the market for KEAM 2018. The candidates are required to reference books which cover the topic for KEAM 2018. Question Paper: Candidate should solve the previous year question papers to get an idea about the difficulty level of the exam. Sample test paper: Candidates have to Work on Mock/sample test papers it will speed up the time and accuracy of the solving papers of the KEAM examination. Syllabus: Candidates must go through each and every topic of the Syllabus. It is important to gather all the topics on your study plans of the KEAM examination. Would it be possible for me to apply for Medical Exams through KEAM? No, it won't be possible to opt for Medical Courses through KEAM anymore. The entire Medical Course selection will be done through NEET from this year onwards. Aspiring individuals are advised to enlist themselves to NEET 2017 for Medical Admissions. What are the important things about the KEAM 2017 examination? A state-level examination, the Kerala Engineering, Medical and Engineering Exam is conducted by the Commissioner of Entrance Examination or CEE Kerala annually. It is popularly referred to as KEAM. It offers scope for eligible candidates to study professional courses that range from agriculture to medical to engineering to even forestry. It is a highly popular examination and finds a huge number of takers every year. A number of seats are available across the many disciplines in the state colleges in Kerala. Memo will be obtained for taking printout. When I tried to download my Admit Card, a Memo will be obtained for taking printout. What should I do for the KEAM 2017? During the scrutiny of the application form, if any discrepancy is found in the applicant’s claim or in the certificates such as failure of producing Nativity, defects in certificate produced and more, then a memo while trying to download the admit card will be obtained. All of the defects will be mentioned in the memo. The necessary documents for correcting the defects should be sent to CEE office on or before the specified date along with the printout of the memo sheet for the KEAM 2017. KEAM 2017 examination be held. In which places will the KEAM 2017 examination be held? KEAM 2017 will be held at the following centres: Thiruvananthapuram, Kollam, Pathanamthitta, Alappuzha, Kottayam, Ernakulam, Thodupuzha, Kattappana, Thrissur, Palakkad, Malappuram, Kozhikode, Wayanad, Kannur, Kasaragod, Mumbai, New Delhi and Dubai. Payment tab in my home page has not turned green yet for the KEAM 2017? I have paid the application fee at one of the selected SBT branches listed by CEE. But the Payment tab in my home page has not turned green yet for the KEAM 2017? The applicants will have to contact the respective branch of SBT and it must be ensured that the bank official collected the cash and the corresponding entry had been updated in “online fee collection portal” meant for CEE. If not, then the applicants should ask the bank official to update the payment status in “online fee collection portal" for the KEAM 2017.